Stop the press: New Smart Covers! 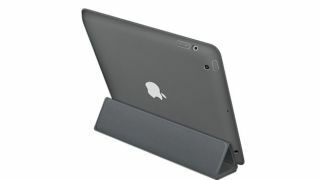 It has taken a while, but Apple has finally launched a version of its Smart Cover that protects the rear of the iPad. The new sheath, which will fit iPad 2 and 3, appreared on the Apple Store when it re-launched after WWDC and features a polyurethane back plate to prevent scratches and minor dings. The case comes in six different shades (light and dark gray, blue, green, pink, and red) and, naturally, features the same folding methods that allow a number of viewing and typing-friendly positions. If you want a little extra protection, as well as the magnetic sleep-and-awake mechanism, you'll need to fork out £39.99 ($49.99). However, it does come with free laser engraving. Whoop. Unsurprisingly the Smart Cover reveal wasn't deemed important enough for a mention during a bumper, fast-paced, yet almost excruciatingly long keynote address at this year's WWDC. Apple fans were greeted with new MacBook Air and MacBook Pro models and a brand new hyrid next generation MacBook Pro category, which also brings a Retina Display into the mix. On the software side of things, we saw the full Mac OS X 10.8 Mountain Lion software revealed, as well as the first look at iOS 6, complete with Facebook integration and a brand new homebrewed Maps app.